Sturgeon is considered to be the most valuable commercial fish. From its delicate flesh, you can prepare a Royal lunch, and caviar and even belongs to the most exquisite delicacies in the world. Not to spoil the taste of future dishes, it is very important to avoid mistakes when cutting the carcass. In the intestines of sturgeon in a huge variety of fruit, the causative agents of botulism, that is why it is so important that directly before dissection sturgeon was still alive. Remember the saying about the second freshness, which just should not be? If you know or at least suspect that the egg-bearing fish, gently vsporite her belly, take out the eggs, followed by the inside. Proceed very carefully so as not to offend the gallbladder. Meat that spilled bile, it does not save, it will only throw. Cut off the head together with the pectoral fins, from there you can get a wonderful jelly. Douse it with boiling water, cut the seal, or as they are called – bugs. Remove the gills, cut the head into several pieces. The next step is to remove the vesiga. 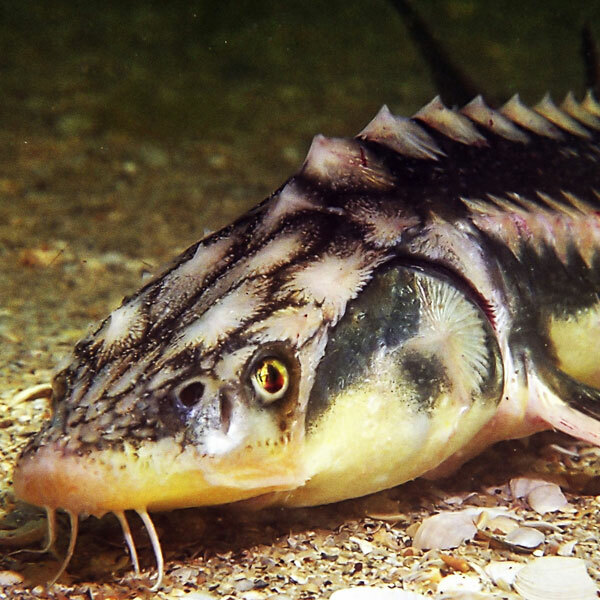 This spinal lived along the entire body of fish is considered poisonous and to use it for food without specialized treatment is impossible, so better not to risk it. Take sturgeon by the tail, make a circular incision in the skin at his base, pick it up, vesiga will slide out by itself. To remove plaque along the entire body, the carcass should be parboiled, a big fish for this procedure will have to cut the cross pieces. If you do not want to bother, just cut them together with a strip of leather. 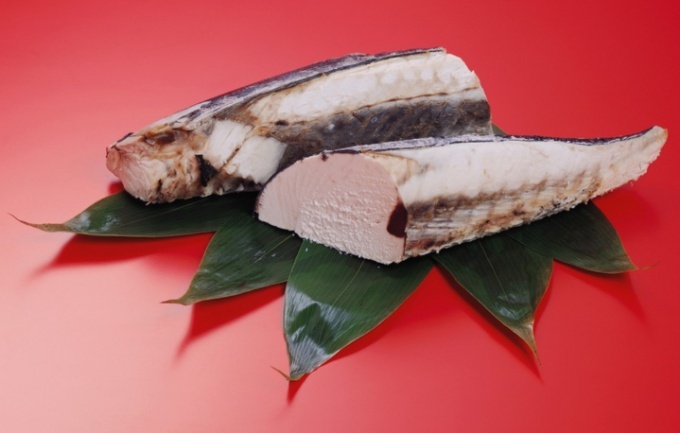 Cut sturgeon can be cut into portions or leave whole, it all depends on what the dish you plan to cook from this king-fish. Portions of sturgeon carcasses it is best to cut at an angle of 30°. In order to clean a sturgeon from the sharp scales, you should pre-freezing it, pour over boiling water. Then score coming off easily and the meat will look half cooked. First things first: clean fresh sturgeon is a time - consuming and traumatic process. The skin of the sturgeon stiff and "glued" firmly, and thorns in any careless movement can cause a very painful and long healing wounds. Therefore, if your goal is to clear it of fresh sturgeon, the easiest way to do this, cut the fish into transverse pieces of about 3 cm thickness then with a sharp knife, the meat just cut from the piece, and the knife is on the inner surface of the thick skins. If you need a shelled sturgeon, then no freeze is not enough. The head tail and fins are better to cut off in advance. After that, the sturgeon is placed in the freezer for a few hours, to a state of deep freeze. Taking a sturgeon out of the freezer, you first need trim the sides with its sharp coswiki. When the frozen sturgeon, to make it no more difficult than sharpening a stick. To cut the scales you need from head to tail, resting sturgeon tail into something solid. To do this it is best to Verchenko, so less likely to prick, and keep the slippery sturgeon easier to use than bare hands. To cut the spines need to of meat - these places will serve us later for removing the skins. 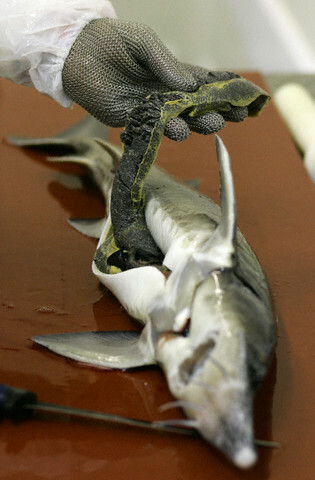 After the spines are cut, the ice cream sturgeon should be parboiled. 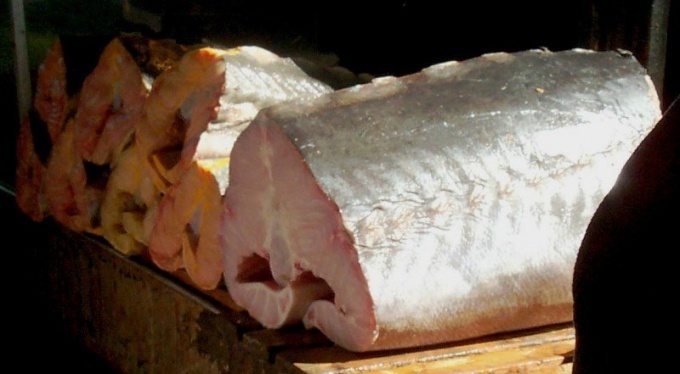 If you do this with fresh fish, we will get the unpleasant effect in the form Polubarinova meat under the skin. Freezing need it in order to keep the meat from heat exposure. After waiting spravania after a few moments, you can begin to remove the skin from tail to head, using the notches on the sides in places, where once were thorns. Scalded skin fades quite simple. If you got a uncut starlet, consider yourself lucky. For cooking you can use all its parts, even the fins and tail. She has wonderful taste and is a delicacy. To cut the starlet is not that difficult, but there are several key points that must be considered. Rinse the fish, place on a large wooden Board. First remove the head. This is necessary under the pectoral fins make the cut on the bias to the head and cut through the cartilage. The pectoral fins are located almost near the head. From the head to remove the eyes, cut the gills. Rinse your head. You need to use it within the hour, or just to clean out the freezer. The gills should be discarded. Remove from the abdomen and sides of the carcass of a large stiff scales. Need to clean off from the tail to the head. Then, release the back sterlet from the sharp "thorns", they are also called bugs. The knife blade direct from ourselves and do not handle bugs with his hands. Cut the belly from tail to head. Gut the fish, remove the innards. Make a careful incision on the tail to the spine about an inch from the fin. Completely do not need to cut. Slowly rotate the tail around its axis and twist the vesiga, lace, located near the vertebral column. This is the most important part of the butchering sterlet. The vesiga need to remove the entire. If it broke, make an incision above and remove the rest with a thick needle. Cut off the tail is put to his head. Clean the fish from the skin. To do this, take a knife when cleaning the potatoes, grab the skin at the tail and haul it in. It can be removed just like a cover. If you have any difficulty when removing the skin, scald the fish in boiling water. Put the fish in front of him back up and cut perpendicular to its length to the links with a thickness of 1,5-2 cm, starting from the head. Put the pieces in a colander and pour over boiling water. This is necessary in order to maintain the shape during further heat treatment. Scalding helps to prevent clots of protein levels on fish. From pre-cut parts sterlet you can cook a wonderful soup, casseroles, roast, bake or smoke. For soups best suited head, fins and tail. To use the starlet with vesiga is strictly prohibited. 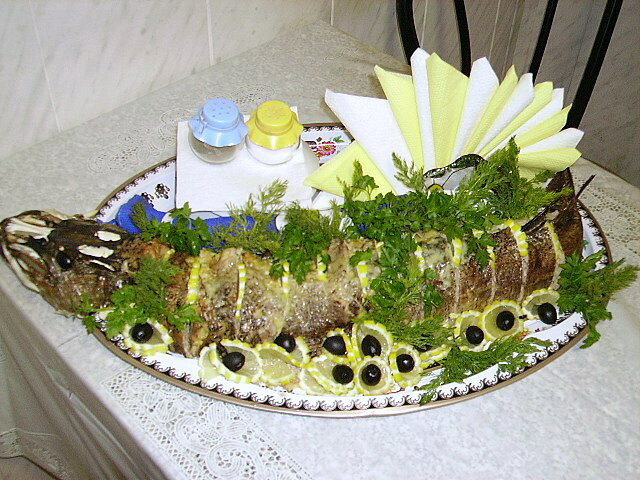 If you want to cook the fish whole, with head, spinal bugs need to remove after cooking, otherwise the fish may lose shaping. In Ancient Russia the economical housewife the Nazis used all parts of the sturgeon: head, tail, scales, etc., including the vesiga. This so-called chordal ridge large red or sturgeon. Vesiga and food from it was pretty common in the cooking of those times. Today is not often seen in collections by cooking recipe dishes visage. It is troublesome, and not everyone can afford. So try these tips in order to properly remove the vesiga of sturgeon. Prepare the sturgeon. If the fish is not chilled, and frozen, it should be well defrosted. Thus, vesiga will not be torn to pieces. Gut the fish and pour over boiling water to make the scales easier to remove. Decide for yourself what you want to cook. Use the vesiga sturgeon in various forms: dried, cooked, cured. But mostly as a filling for pies, casseroles, pie. Select the option for visage. Remove the vesiga range of sturgeon in two ways. After cutting fish or before. Since removing visage of sturgeon requires some effort, leave it to a man. If sturgeon is not very large, it will approach the second method, a more rapid and effective removal of visage to cutting. First, cut off the head and make a slit flesh along the ridge of the fish without damaging the spine. Incise the flesh around the spine of the sturgeon, as if you wanted to cut off the tail. But at the same time without affecting the range. Followed by a circular motion along the axis of the ridge to reverse the tail and gently, slowly pull the vesiga. If all the same it ended, you can continue removing it the first way. After the vesiga washed and cleaned from the top of the soft layer, as it is inedible. Before the actual cooking of cake or pie the vesiga is usually rolled up in small balls and dried. In the old days it was dried for several days on a special wooden shields, and in our technologically advanced time, this process can be accelerated with the help of the oven. Dried at low temperature for about four hours. Some furnaces are equipped with special functions. Well, the recipe from bisigi each chooses for himself. Sturgeon – a great product suitable for any culinary delights. It is possible to fry, bake, saute, stuff, salt... But first the fish must be cut. Defrost the fish, if it was stored in the freezer. To make it better, shifting sturgeon in the fridge or leaving the room for a while. If the time for slow defrosting no, use the "defrost" in the microwave oven or, in extreme cases, put the fish in a bowl of cold salted water. Drench sturgeon very hot water to get all slime and scales on the sides make it easier to remove. Put the fish on the table or on a cutting Board and a sharp knife, separate the head and the head fins. Gently remove the gills, as they will add bitterness to the dish. Easy to remove fins you can use kitchen scissors. A well-sharpened knife, slice off the dorsal fin, which must be removed along with a small strip of skin. Cut from the carcass the tail and remove vasiga (chord of the spine). Vyaziga located in the spinal column. To remove it you need to pry it with your finger and leave a piece of long cord. Cut the fish along the entire length of the back, dividing it into two layers. Be careful to get the cut the body in pozvonocna cartilage. The cut should go through the middle of existing cartilage fat. Cut the fish into portions, which are called links. Too much links still divide into 2-4 pieces. Vasiga you can delete immediately, but directly from each link. Despite the fact that the meat of sturgeon is called the red, in fact, it's white. But in this case, red means beautiful. In the old days it was called the most valuable. Choosing fish in the store, please note that the gills of a fish of good quality should fit snugly to the torso and have a bright red color. Do not purchase fish which gills are gray or brown. You should not take fish with a pungent smell. Look at the appearance of the carcass: the sides should be clean and damp, eyes – clear, and all sorts of spots absent.